TransmiR is a database for transcription factor (TF)-microRNA (miRNA) regulations, through which one can find regulatory relations between TFs and miRNAs. In this major update to TransmiR v2.0, we manually curated 2,852 TF-miRNA regulations from 1,045 publications during 2013-2017 and included ChIP-seq-derived TF-miRNA regulation data. Currently, TransmiR v2.0 contains 3,730 literature-curated TF-miRNA regulations, which cover ~623 TFs, ~785 miRNAs, 19 organisms and 1,349 publications. Besides, we also provide 1,785,998 TF-miRNA regulations derived from ChIP-seq evidence in 5 species. All TF-miRNA regulations were annotated in detail, and experimentally validated miRNA-TF feedback regulations from miRNA target database TarBase and miRTarBase were also included. If the user have single miRNA, TF or disease at hand, all above transcriptional regulation data can be searched and graphically visualized in "Search" page and "Network" page, respectively. Furthermore, we constructed "Enrichment analysis" module to identify the significant TFs that are likely to regulate a miRNA list of interest. Finally, a "Predict" module was implemented, which enables the prediction of TF-miRNA regulations based on binding motif matrices of human TFs. TransmiR v2.0 is freely available for academic usage. Users can also download the datasets for further analysis. This website has been tested by using Chrome, Microsoft Edge and Firefox browsers. Microsoft IE may not work well. May, 2018, TransmiR v2.0 was released. 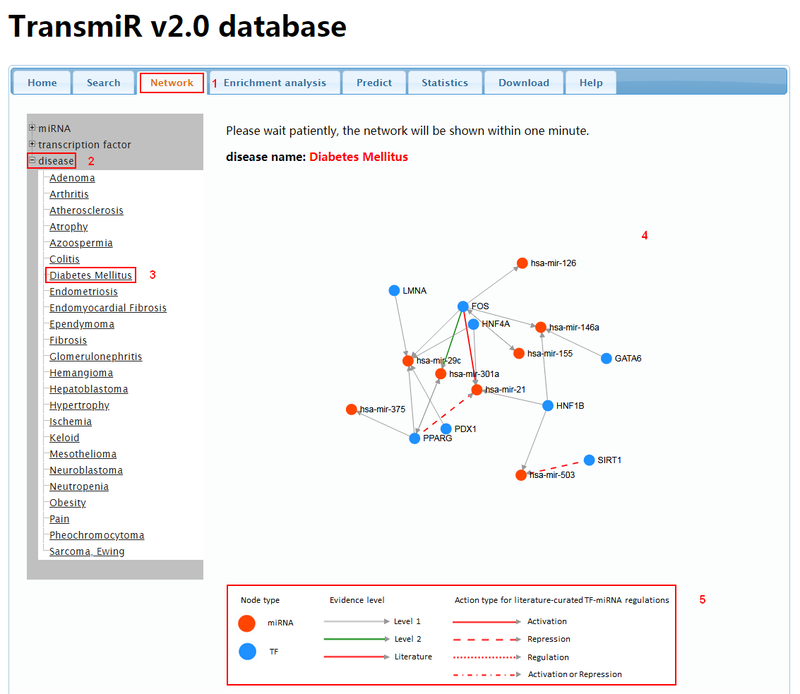 January 30, 2013, TransmiR v1.2 was released (125 new entries were added into TransmiR). September, 2009, TransmiR v1.0 was released. TransmiR is free only for academic usage. For commercial usage, please contact the following PIs. In the "Search" result, each entry has 9 items. Step2: Size of miRNA category. In the "Search" result, each entry has 8 items. Up to now, TransmiR v2.0 contains 3,730 literature-curated TF-miRNA regulations from 1,349 publications and 1,785,998 TF-miRNA regulations derived from ChIP-seq evidence. Based on the reliability of the transcriptional regulatory region annotation used, we further classified the TF-miRNA regulation data derived from ChIP-seq into level 1 and level 2. From Figure 1, you can see the distribution of transcriptional regulation data at different levels of evidence. The literature-curated TF-miRNA regulations in TransmiR v2.0 include ~623 transcription factors, ~785 miRNAs and 19 organisms. 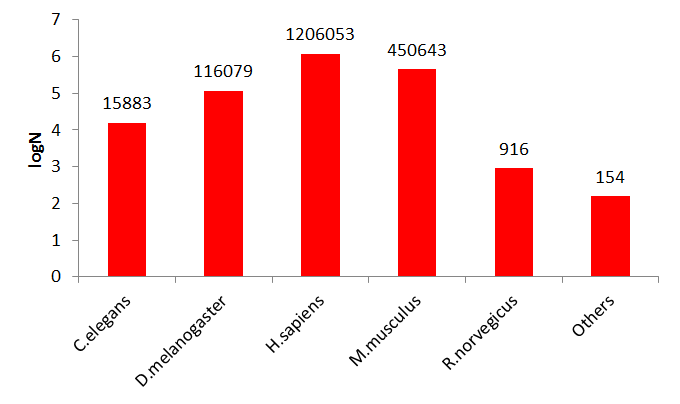 From Figure 2, you can see the distribution of literature-curated TF-miRNA regulations in different species. In order to give an intuitive view of the distribution of all evidence level TF-miRNA regulation data in different species, we have also plotted histogram (Figure 3). What are TransmiR and TransmiR v2.0? How to use "Search" function? How to use "Network" function? How to use "Enrichment analysis" function? How to use "Predict" function? What does transcription factor annotation information include? What does microRNA annotation information include? What is the difference between the evidence level 1 and level 2? 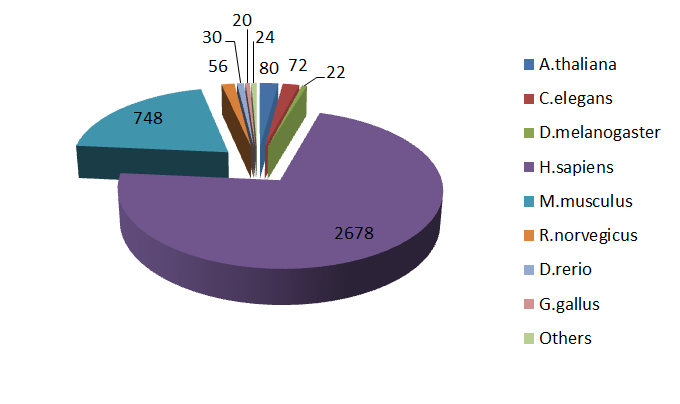 Which genome assemblies were used in TransmiR v2.0? Q1. What are TransmiR and TransmiR v2.0? MicroRNAs(miRNAs) are important post-transcriptional regulators of gene expression and play critical roles in various biological processes. It has been reported that aberrant regulation of miRNAs was associated with the development and progression of various diseases, including cancer, cardiovascular disease, etc. But the underlying mechanisms remain elusive, partly because the integrative data of transcription factor (TF)-miRNA regulations is far from sufficient. TransmiR is a database for transcription factor (TF)-microRNA (miRNA) regulations, through which one can find regulatory relations between TFs and miRNAs. TransmiR was originally constructed on September 2009 and updated on January 2013. In this major update to TransmiR v2.0, we manually curated 2,852 TF-miRNA regulations from 1,045 publications during 2013-2017 and included ChIP-seq-derived TF-miRNA regulation data. Currently, TransmiR v2.0 contains 3,730 literature-curated TF-miRNA regulations, which cover ~623 TFs, ~785 miRNAs, 19 organisms and 1,349 publications. Besides, we also provide 1,785,998 TF-miRNA regulations derived from ChIP-seq evidence in 5 species. All TF-miRNA regulations were annotated in detail, and experimentally validated miRNA-TF feedback regulations from miRNA target database TarBase and miRTarBase were also included. If the user have single miRNA, TF or disease at hand，all above transcriptional regulation data can be searched and graphically visualized in "Search" page and "Network" page, respectively. Furthermore, we constructed "Enrichment analysis" module to identify the significant TFs that are likely to regulate a miRNA list of interest. Finally, a "Predict" module was implemented, which enables the prediction of TF-miRNA regulations based on binding motif matrices of human TFs. TransmiR v2.0 is freely available for academic usage. Users can also download the datasets for further analysis. Q2. How to use "Search" function? To search data in the database by a miRNA or TF name, please click the "Search" tab in the menu (1 in Figure 1). TransmiR v2.0 provides functions to "Search" by full/partial names (i.e exact and fuzzy modes, respectively) of transcription factors and microRNAs. Specify the species, input type (TF or miRNA) and searching mode (exact or fuzzy) (2 in Figure 1), then you can input your search keywords (i.e "hsa-mir-200a") into corresponding blanks (3 in Figure 1) and submit the query (4 in Figure 1). Each "search" result will return entries including the following nine items. (9) Species - The species of the TF-miRNA regulation. You can start a new search by clicking the "Reset all" button (5 in Figure 1). And you can also download the search result by clicking "here" (6 in Figure 1). Q3. How to use "Network" function? To visualize TF-miRNA regulation data in the form of a network diagram, please click the "Network" tab in the menu (1 in Figure 2). To browse the TF-miRNA regulatory network related to one miRNA, please click "miRNA" to expand the tree architecture, then choose the species and select the specific miRNA you are interested in. The network related to specific TF or disease can be browsed by the similar way. For example, if you want to view the TF-miRNA regulatory network related to "Diabetes Mellitus", please click the "disease" (2 in Figure 2), and then select "Diabetes Mellitus" (3 in Figure 2). The corresponding network diagram will be shown on the right panel (4 in Figure 2). The legend of the network is available at the bottom-right corner of the panel (5 in Figure 2), where the meaning of each element in the network is explained. Each TF-miRNA regulatory network is constituted by TFs and miRNAs as its nodes, while TF-miRNA regulations and miRNA-TF regulations as its edges. Within the network view, you can drag a node with the mouse and use "Ctrl + mouse wheel rolling" operation to zoom in/out. Firefox, Safari, IE9, and Chrome can all display the TF-miRNA regulatory network properly. Q4. How to use "Enrichment analysis" function? If you have a list of miRNAs and want to find the overrepresented TFs regulate them, please click the "Enrichment analysis" in the menu (1 in Figure 3). The enrichment (overrepresentation) analysis of TFs can be performed as described below. Firstly, input or paste a list of miRNAs into the text box (2 in Figure 3), you can also click "Example" button (3 in Figure 3) to load an example miRNA list. Secondly, set the size of miRNA category (4 in Figure 3). This choice limits the size of miRNA category to a certain range. Thirdly, choose the lowest confidence level (5 in Figure 3). Level 2 data is limited to the miRNA promoters supported by experimental data, see more in Q.9 in FAQs. Therefore, if you prefer better stringency but less coverage of the analysis results, you should choose "Set level 2" option. Finally, click the "run" button (6 in Figure 3) to submit the query. You can browse the result of enrichment analysis in a new tabular page, where the miRNA category (i.e. regulating TF) and the associated statistics (P-value, Bonferroni, FDR, etc.) are shown. Q5. How to use "Predict" function? To query the predicted TF-miRNA regulations based on binding motif matrices of human TFs, please click the "Predict" tab in the menu (1 in Figure 4). "Predict" module provides functions to query the prediction results by full/partial names (i.e exact and fuzzy modes, respectively) of transcription factors and microRNAs. Specify input type (TF or miRNA) and searching mode (exact or fuzzy) (2 in Figure 4), then you can input your search keywords (i.e "ZEB1") into corresponding blanks (3 in Figure 4) and submit the query (4 in Figure 4). Each "search" result will return entries including the following eight items. You can start a new search by clicking the "Reset all" button (5 in Figure 4). And you can also download the search result by clicking "here" (6 in Figure 4). Q6. How to download datasets? 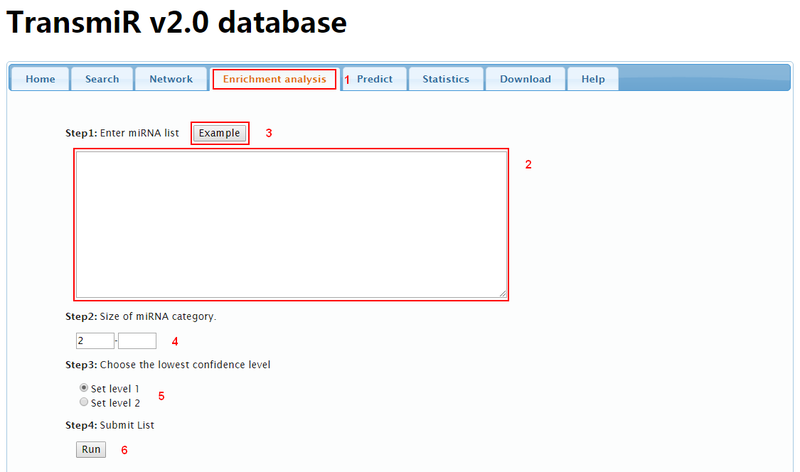 To download datasets in the database, please click the "Download" tab in the menu. TransmiR v2.0 provides two formats of downloadable files, i.e. Excel .xls and textual .tsv formats, respectively. The users can download both literature-curated TF-miRNA regulation data and all TF-miRNA regulation data (including the data derived from ChIP-seq experiments). Q7. What does transcription factor annotation information include? Each transcription factor annotation entry contains the following five items: Gene official symbol, Entrez gene ID, Ensembl gene ID, gene associated diseases (from DisGeNet database), and cancer prognostic association data (from The Human Protein Atlas database). For TFs which occur in non-human species, we tried to map the annotations according to its human orthologs recorded in OMA database. Q8. What does miRNA annotation information include? Each miRNA annotation entry contains the following five items: miRNA name, miRBase ID, genome context of this miRNA gene, miRNA associated diseases from HMDD v2.0 database and a link to miRBase database. Q9. What is the difference between the evidence level 1 and level 2? Based on reliability of the transcriptional regulatory region (promoter region) annotation used, we classified the TF-miRNA regulations derived from ChIP-seq into level 1 and level 2. For level 1, we choose 5'-end of the pre-miRNA or that of the first member in the miRNA cluster as the transcription start site. Next, a window from the 5kb upstream to the 1kb downstream of the miRNA TSS was identified as the putative transcriptional regulatory region. Apparently, this definition could cover most of the miRNAs, but suffers from substantial inaccuracy. 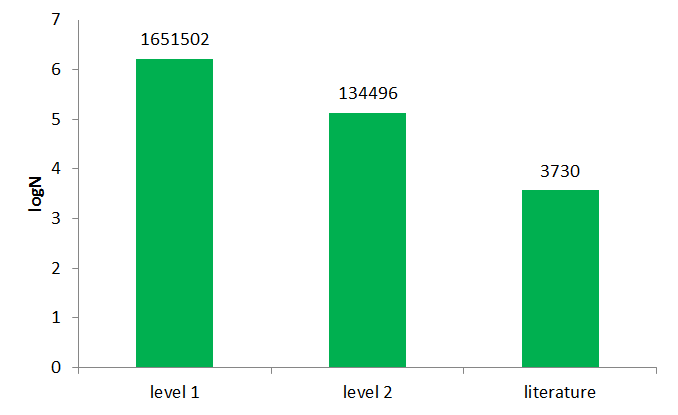 Therefore for level 2, the miRNA TSS was supported by high-throughput experiments from literature. And the 300bp upstream and 100bp downstream of each miRNA TSS was identified as the putative transcriptional regulatory region. The level 2 TF-miRNA regulations are much more stringent than level 1 TF-miRNA regulations, but cover less miRNAs. Q10. Which genome assemblies were used in TransmiR v2.0? The genome assembly versions of all species are consistent with miRBase v22. The specific genome assembly versions are as follows. Citation: Wang J, Lu M, Qiu C, Cui Q. TransmiR: a transcription factor-microRNA regulation database.Nucleic Acids Res., 38 (Database issue):D119-22.